For MMGM, I am recommending the classic A Wizard of Earthsea by Ursula K. Le Guin. This book is 48 years old, but it seems both easy to read, unlike other classics, and completely different from every other fantasy book today (which is not a bad thing). It tells the story of a boy named Ged who, in his youth, accidentally released what is referred to as the shadow into the world as a result of trying to prove his power by summoning a spirit. In trying to fix the mess, Ged, who is an adult for most of the book, ends up becoming much more likable, as he quickly realizes his mistake.The book's writing is amazing, sounding very poetic and great for reading aloud or to one's self. One interesting aspect of the book is true names, which are the names of people or things in an old language known as the Old Speech. Wizards use these names to gain power over what they are naming, but Ged does not know the name of the shadow. The end of the book is both genius and foreshadowed throughout the book. Although the book is short, with few characters, it only makes those words and characters who are there matter more. This book is an amazing classic of literature that should be read by everyone. For Poetry Sunday, I am recommending "How the Milky Way Was Made" by Natalie Diaz. I hope you enjoy it! 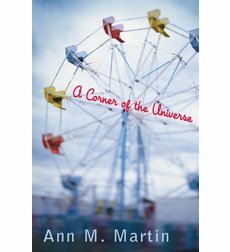 For MMGM, I am recommending A Corner of the Universe, a recipient of the Newbery Honor, by Ann M. Martin. Hattie, a shy girl who prefers the company of adults, takes immediately to her excitable uncle, even when the rest of the family — her parents and grandparents — have trouble dealing with his intense way of seeing the world. And Adam, too, sees that Hattie is special, and that her quiet, shy ways are not a disability. It's hard to come up with an introductory sentence that describes just how amazing this book is. The main character, Hattie, is kind of shy and has only one friend, at least until she meets her uncle Adam. The author depicts Adam's mental illness in a realistic, yet non-insulting, way. Although you know he isn't exactly normal, he doesn't seem crazy. One of the book's major topics is being ashamed because of others, such as Adam's mother seeming somewhat horrified at her son, or another friend that Hattie makes during the summer whose mother works in a visiting carnival. Hattie is a likable main character who seems wise for her age. At the end of the book, something incredibly sad happens, but it is not relentlessly depressing. Although the book does have a somewhat adult moment and the sad occurrence mentioned previously, it is an incredibly beautiful book for everyone. For Poetry Sunday, I am recommending "Daylight Savings" by Jill Bialosky. I hope you enjoy it! Note: If a glitch sent you here when you were looking for Natalie Aguirre's post, click here. Be sure to enter in either of my sidebar polls (the top one has been reopened, and the old one is new and will close in about 2 weeks)! 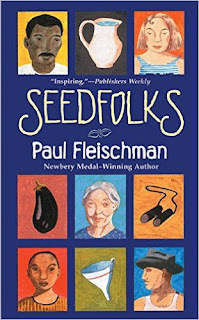 Finally, in honor of Martin Luther King Jr. Day, I am recommending a diverse book, which is Seedfolks by Paul Fleischman. Thirteen very different voices and perspectives—old, young, Haitian, Hispanic, tough, haunted, and hopeful—tell one amazing story about a garden that transforms a neighborhood. I love this book! It is set in a neighborhood in Cleveland inhabited by people of many different ethnicities, all of whom have, in the past, been mostly separate. The book is told through the viewpoints of about 15 different characters, each having a different personality and backstory. In the unique story, the characters are changed by the garden and brought together. Each character's story is only about 5 small pages with large font, comprising the 87-page book. However, every moment is important to the story, making it feel just as complex as any longer book would. This is a great book for everyone! Poetry Sunday (1/15/2017): THE RESULTS! I am shocked at how many poems were entered in the New Year's Poetry Contest: 8!!! Now, it's time for: THE RESULTS! For there's good to come. To our New Year's resolutions. I love this poem! I've always loved poems that can distill complexity into a small format! And, last but not least, we have a poem from Voole, entitled, "Central Texas Theme:"
A maize truck turning in dry pods for life. smelling of Alva Ann, Luling and cottonseed ham. Spring’s hope? all gone in seeds-gone to seeds. like fire into wet, red caves. another start—seed pods lingering in kickoff hope. Renewal hounds the bitter wind. New life. Heck, he’s bigger than life-he’s our town. They stand for all of us and we sit for them. Little seeds braving icy shots and wet ruin. and carry, fill it up for no pay. leave the house and hope dies-streamers kill it. Open streamer cars sending gulps through closed thoughts. in little oak hotels, dry and bitter, filled with hope. I’ll open too then and try once more. I love this poem! I like the descriptive language! All of you should expect 2 emails, one telling you that you're a winner (this will come from Completely Full Bookshelf) and another with your eGift card (this will come from Barnes & Noble). Be sure to check your spam emails if you do not receive your eGift card. Thanks to everyone who entered, and one more round of applause to the winners! For Poetry Sunday, I am recommending "Birches" by Robert Frost. Here is the link. I hope you enjoy it! Also, be sure to enter the extended New year's Poetry Contest. Click here to enter. Firstly, I am extending the deadline for the New Year's Poetry Contest for one week! Remember that, if your poem is good enough, you will win a $20 Barnes & Noble eGift card, which you can use in store or on your Nook! Click here to enter. Secondly, for MMGM, I am recommending Dumpling Days by Grace Lin. I have recommended another book by Grace Lin in the past, When the Sea Turned to Silver. Although this book is the third in a series, it, for the most part, makes sense by itself, and is easily the best of all three great books, which are based on the author's real life. One great part of this book is getting to learn about the culture of Taiwan and how different it is from the United States. Much of the culture is expressed either through short anecdotes, which are very interesting, or through events in the story. The main character, Pacy, often feels out of place in Taiwan or, in the case of her art class, feels less talented than others. However, by the end of the book, Pacy ends up enjoying Taiwan. 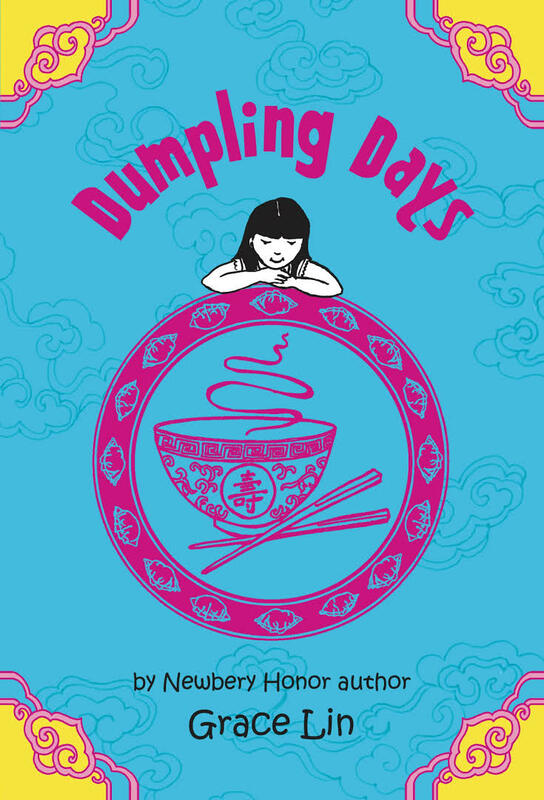 This book is great for anyone who is interested in other cultures! Firstly, I am holding a New Year's Poetry Contest, where you can enter your own poem(s) about the new year (with reasonable restrictions) for the chance to win a prize! Click here to enter. 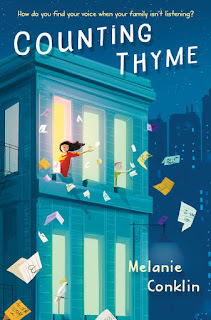 Secondly, for MMGM, I am recommending Counting Thyme by Melanie Conklin. This is one of my favorite books! Firstly, although this book is mainly about Thyme's family's struggle with Val's cancer, the book is not overly depressing. It is, in fact, uplifting! However, it does have many conflicts, such as Thyme's guilt about wanting to leave New York (not helped by the fact that she has somewhat of a plan to return to California, at least for a short time). Thyme's school life is also enjoyable to read about, as she makes friends and deals with a fight between two classmates she has met. 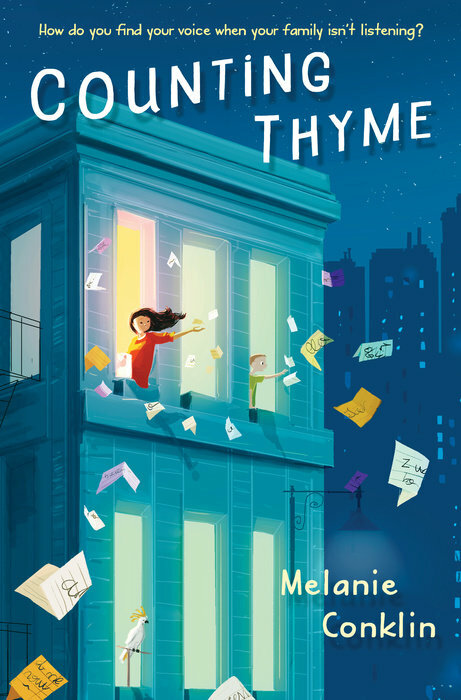 The book's characters have strong backstories and personalities, such as Mr. Lipinsky, Thyme's neighbor, who is often grouchy, mostly due to having lost his wife, but who later befriends Thyme. Although this book is sad at many times, it is happy enough to be a great read! Since it is New Year's, I would like to thank everyone who has allowed this blog to prosper, such as my 5 e-mail subscribers (it may not seem like many, but having any subscribers is amazing! ), those who comment on my posts (94 comments have been posted this year! ), and those who write awesome books and poems that I can recommend! The three poems which I deem best will be posted next week along with the poets' nicknames (if given). If your poem is selected to be posted next week, you will win a $20 eGift card to Barnes & Noble. Your poems must be about the new year or about New Year's celebrations. YOUR POEMS MUST NOT DISCUSS OR HINT AT POLITICAL OPINIONS IN ORDER TO BE CONSIDERED. YOUR POEMS MUST BE APPROPRIATE FOR ALL AGES. To enter, use the Google Form below. Nicknames are not required. Your nickname is simply a way for your poem to be identified if I select it. Email addresses are required (but they will not be publicized and will be deleted after the contest ends) in order for me to send your e-gift card to. The deadline for the contest is (in central daylight time/CDT) 12:00 A.M. (midnight) on January 8 January 15, 2017. Please enter a poem below! Update: The contest has ended! Click here for the results.